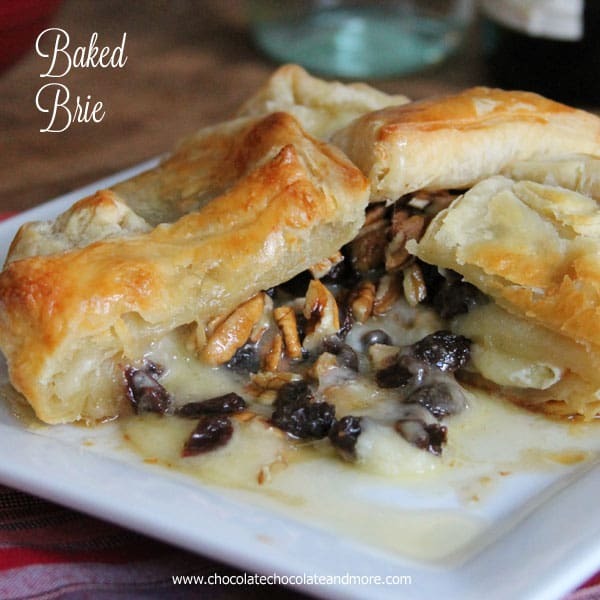 Baked Brie #SweetNaturally - Chocolate Chocolate and More! 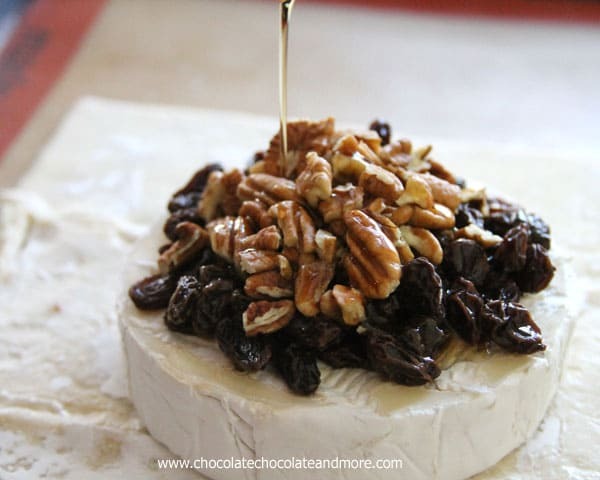 Baked Brie topped with rum soaked raisins, pecans and just a touch of maple syrup. then wrapped in a flaky puff pastry. This time of year, it’s all about the sweets. Cookies, cakes, candy, pies. But it’s also about gathering together. Family, Friends, co-workers. It seems like there’s Always another event calling for food. 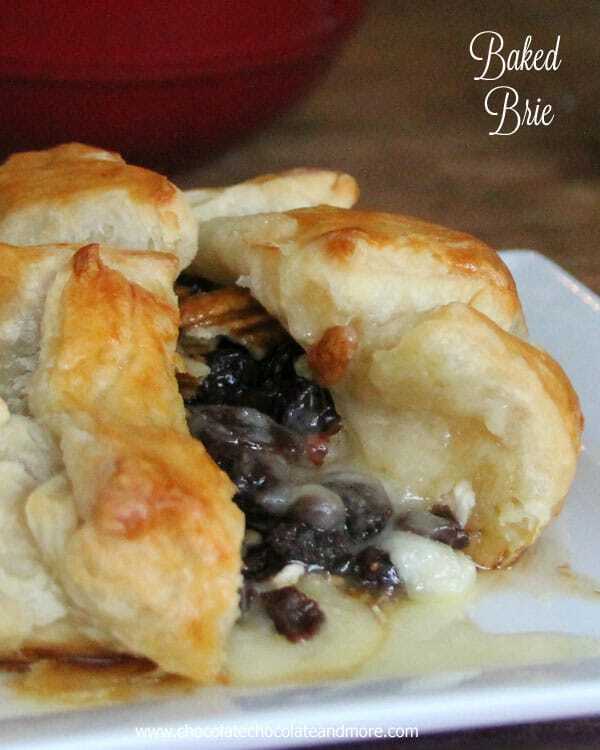 One of my favorite appetizers is Baked Brie. It’s fast and easy to put together and is always a hit. 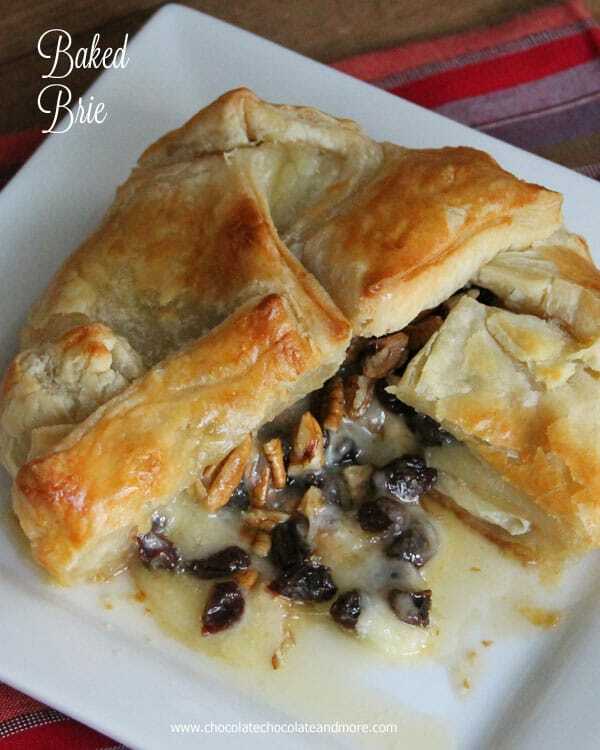 I love using raisins for a naturally sweet flavor that pairs well with the brie. Not using additional sweeteners means I don’t have to feel as guilty at the dessert table. 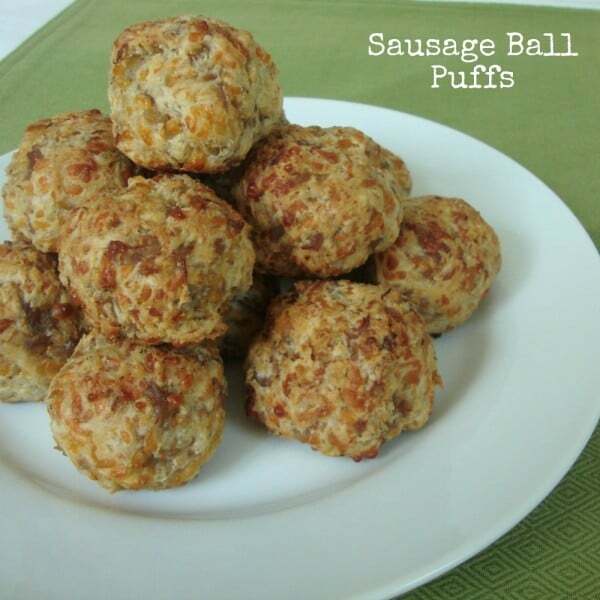 The pecans give a light crunch and the maple syrup melts into the cheese adding a little extra sticky goodness. If I’m carrying this to another location, I’ll prepare it ahead of time and then bake at the new location when I get there. Set puff pastry on a lightly floured cutting board to thaw according to package directions. Place raisins in a small bowl and add rum. Stir just to mix. Let sit until ready to use. Once pastry dough is thawed, transfer dough to a parchment lined baking sheet. If there are any splits or cracks in the pastry dough be sure to mend them by lightly pinching dough back together. Place Brie wheel in center of dough. Drain any excess liquid from raisins then place raisins on top of cheese. Add pecans then drizzle with maple syrup. 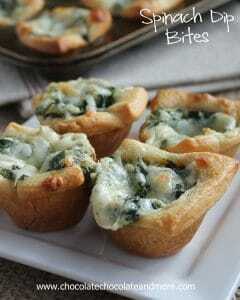 Carefully fold up sides of pastry and fold over top of cheese. Whisk egg yolk and water together then brush top and sides of pastry with egg wash.
Bake in a preheated 400 degree oven for 22-25 minutes, until pastry if golden brown and flaky on the outside. Remove from oven and let sit for 5 minutes before transferring to a serving dish. Serve with crackers and fresh fruit. I worked together with the California Raisin Marketing Board to create this recipe and was compensated for my time. All opinions are mine and mine alone and do not represent those of the California Raisin Marketing Board. As alway, I only share things with you I truly love. This looks amazing! I want to make it for a holiday party this weekend. I’ve never used brie before. Does it have a rind that has to be removed? Or just use it as is when I buy it at the store? Just want to be sure I do it right! So delicious looking!! Thanks for the recipe. All I could find was a round package of softened brie – will this work? 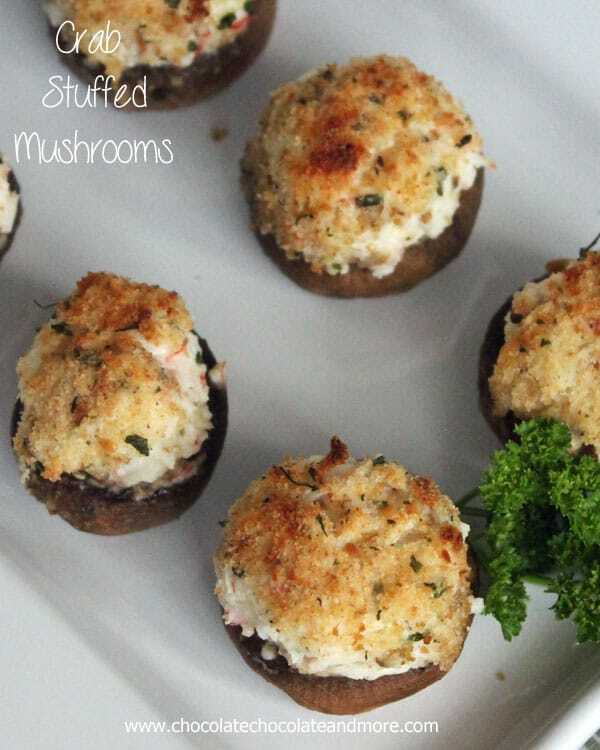 I am determined to make this during the holiday season! Thanks for the wonderful recipe! Yes a round wheel will work just fine. Enjoy!